Segments Along A Horizon features, in book form, a sequence of nine original paintings by Ian H. Boyden that investigates our relationship with the line of the horizon. This investigation is framed by excerpts from Ralph Waldo Emerson's Nature (1836). The opening excerpt reads: "The river, as it flows, resembles the air that flows over it; the air resembles the light which traverses it with more subtile currents; the light resembles the heat which rides with it through Space." This text sets the tone for visual explorations of the variety of currents, rhythms, and plays of air and land that form and transform the horizon. The series of paintings is followed by Emerson's reflection that, "In the tranquil landscape, and especially in the distant line of the horizon, man beholds somewhat as beautiful as his own nature." The paintings were painted on Hahnemühle Copperplate; the text is set in Centaur and Gill Sans and printed letterpress; and the drum-leaf binding features wooden covers of black limba and a leather spine. 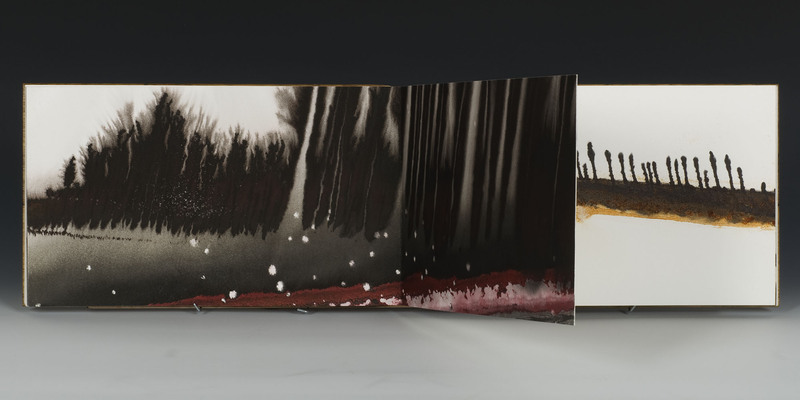 The book is signed by the artist and presented in a silk- and cork-lined Solander box. Segments Along A Horizon was designed, printed, and produced by Ian Boyden. Produced by commission. Dimensions: 9 x 15 inches.